A bucket of water from Jeri Bolden’s home. Photo by author. Growing up, my friends called it “the White man’s water.” That was the kind that seemed safe and tasty enough to drink. Unfortunately, few of us had it growing up in Leland, MS. Even I, living in the neighborhood coined “The White Folks Section”—so called because it was where white residents traditionally lived before integration drove them to the outskirts of town—was denied the White man’s water. Leland is a small, 75 percent black town on the banks of Deer Creek in the Mississippi Delta. Like most places in the Delta, Leland was originally a place for and about growing cotton, as evidenced by the miles of plantations surrounding the town. Eventually, it also became known for its rail line, which shipped a stream of freight and people to and from the vulgar little place outsiders called the “Hellhole of the Delta.” The town’s slow decline is marked not only by its declining population—over 30 percent, down to about 4,500, since its peak in 1980—but also by the removing of the railroad tracks. Its survival is likely due only to its strategic location at the intersection of two major highways: US Route 61, which runs north-south from New Orleans, up through Memphis, St. Louis, and Saint Paul; and US Route 82, which runs east-west from the Georgia Coast to New Mexico. This location provides just enough industry—a La-Z-Boy furniture manufacturing plant, a Pepsi distribution warehouse, and a FedEx facility—to stave off the death of the town, but not enough to overcome the 40 percent poverty rate and $20,000 median income. Other than our youthful commentary about the White man’s water, we never spoke about water safety. I’m unsure exactly when it happened, but at some point it became an unspoken understanding that we should refrain from drinking the water in our homes whenever possible. I have memories of refilling a large plastic water pitcher from the kitchen sink as a young child and taking long baths in presumably safe water, but the details of the transition to bottled water are fuzzy. At some point during my childhood, faucet water became for cooking and emergencies, and discovering that the house was out of bottled water meant that you didn’t drink—maybe you drank something else; maybe you went thirsty. Thirsty visitors tended to default to the refrigerator, searching for bottled water. My grandmother stored water as if we were facing an emergency, and in some ways we were. Her home was stacked with cases of water, and she even went so far as to store a case of bottled water in the trunk of her car just in case her hosts had neglected to purchase their own. She commonly sent me to her car to retrieve a few bottles to refrigerate just in case she became parched while we were visiting her siblings or friends. Faucet water was simply not an option. I casually carried this aversion to tap water through two degrees at the University of Mississippi and three years at Duke University. It had become a taken-for-granted habit: I simply didn’t drink faucet water. At some point along the line I stopped storing bottled water in my home and upgraded to pitchers with filters. When I was going out for a while, particularly to someone else’s home, I typically followed my grandmother’s rules, and stopped by the store to purchase a bottle of water for my trip. On a visit home in October, I drove past a woman standing outside city hall with a sign that read, “unsafe water.” After taking a moment to process what I’d seen, I drove around the block to park my car and talk to her. Her name was Jeri Bolden, a 68-year resident of Leland, and she was just as eager to talk to me as I was to talk to her. But her sharing was not limited to strangers on the street. She told me that she had been attending town hall meetings for months, almost begging the city to investigate the water, and she met nothing but walls, being pushed to the bottom of the agenda and denied the opportunity to speak. She even reports an interaction with the Mayor, Kenneth “Kenny” Thomas, where he dismisses her water complaints because his water “doesn’t look like that.” As she recounts this interaction, she tells me that she isn’t surprised by his assertion that his water appears clearer than hers because he owns local hotels and wouldn’t serve such shoddy water to his customers. And while her claim is speculative, she may not actually be too far off. Though Leland is served by one municipal water facility, it’s not uncommon for businesses, particularly hotels, to run their water through an additional set of filters or other processes before presenting it to customers. Moreover, segregation runs deep in the small town. Neighborhoods and schools are almost completely segregated, with White people living in near-all White developments on the fringes of town and almost exclusively attending private schools. 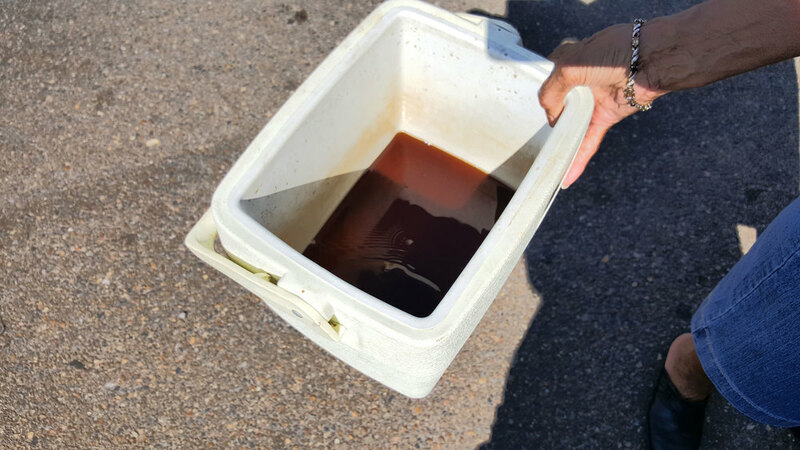 It’s not unreasonable to think that their water doesn’t look like ours, and for Bolden, this is simply another case of racism in a place where racial inequality has long been stretched to extremes. Similar to my childhood friends, she lamented the differences in “the White man’s water” and our own. But she is not alone anymore. Bolden’s tenacity caused me to reflect on how complacent I had become with the quality of my hometown water, and I have since discussed water quality with a number of state officials. According to the results of monthly bacteria testing that I was able to acquire, Leland has been clean with the exception of one test in January 2015, but officials suspect that was a contaminated sample because subsequent tests of resamples were clean. Less frequent tests for inorganic compounds have revealed minerals such as arsenic, chromium, and mercury but at concentrations below the maximum contaminant level set by the state and federal governments. But these test results, especially without deeper explanations, are unsatisfactory when our experiences in this community directly contradict them. The results don’t speak to the griminess I feel after completing a shower, forcing me to truncate all of my visits home, or Bolden’s inability to bathe in her own tub, prompting her children to repeatedly ask her to move. They say nothing of the discoloration of the water, the yellowing and browning, and the occasional awful stench. They don’t explain the cases of water in my grandmother’s trunk or the store bought water on Bolden’s stove. They fail to shed any light on why I cringed at an offer of tap water in North Carolina or the seemingly universal sentiment that there is just something wrong with the water. We can’t all be crazy.